Ever wanted to visit a castle that is a Guinness World Record? 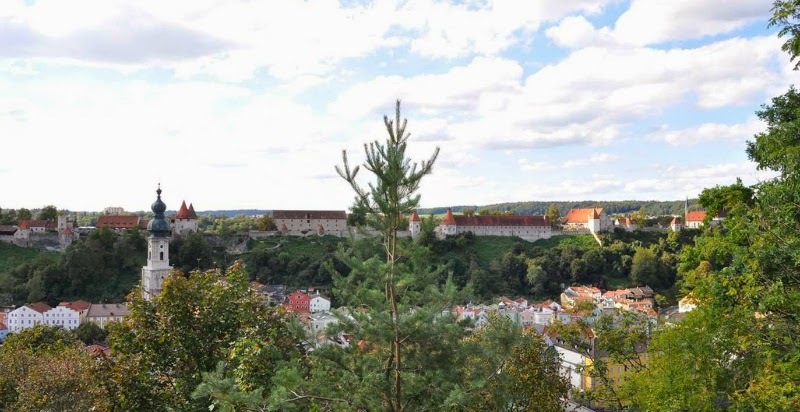 You can do so in the Bavarian town of Burghausen as the Burg zu Burghausen, which measures 1,051.02 metres (or 3,448 ft 2 in), is the world's longest castle according to the record book. Spanning for more than a kilometre over a hill above the town of Burghausen, the Burg has no less than six courtyards and is considered to be one of the most magnificent examples of late medieval fortifications. While the Burg's origins predate the year 1025 when it was firstly mentioned, the hill on which the castle is situated was already settled in the Bronze Age. The first greater expansions of the castle occured in 1090. After the death of the last Count of Burghausen, Gebhard II, in 1168, the Burg zu Burghausen came into the possession of the Wittelsbach family. On September 16th, 1180, Otto I of Wittelsbach was made Duke of Bavaria, a territory that was ruled by his descendants the following 738 years until the abolishment of the monarchy in all of Germany in 1918. After the first division of Bavaria, Duke Heinrich XIII received Burghausen and it was him who built an entirely new castle starting in 1255. The inner castle chapel is believed to the the oldest early Gothic church in all of southern Bavaria. For a long time, the Burg was the second residence of the Dukes of Bavaria in addition to Burg Trausnitz in Landshut. During most of the Middle Ages, the castle was extensively expanded and transformed into a closed fortified and living castle including large gardens. Under Duke Georg of Bavaria (1479–1503) the work was completed and Burghausen Castle became the strongest fortress of the region. As a result of the War of the Succession of Landshut, the Burg ceased to be an official ducal residence and became an occasional domicil of the sons of Duke Albrecht IV instead. However, the castle had great military importance due to the threat of the Ottoman Empire. During the Thirty Years' War Gustav Horn was kept imprisoned in the castle from 1634 to 1641. After the Treaty of Teschen in 1779 Burghausen Castle became a border castle. During the Napoleonic Wars the castle suffered some destruction and starting in 1891, alterations, demolitions, planation, privatisation of parts of the fortress and the abandonment of the garrison took place. In the first courtyard the Palace of the Duke's Residence, the Kemenate, The Durnitz (Gothic Hall), the Inner Castle Chapel and the Treasury are located. The Inner Castle Chapel was built during the 13th century, a time period when architecture changed from Roman to Gothic style and hence the outer walls of the chapel were built in Roman style and the inner style of the chapel was Gothic. The second courtyard is quite large though many of the original buildings are gone and have not been rebuilt. Originally it contained the stables, a well, the main kitchen and the bakery as well as the lodges of the grooms and pages. In the third courtyard the smithy and an arsenal were located. Grain was stored on the upper two floors of the arsenal. It has one of the most distinguished and best preserved bridge and gate of any castle of medieval times. It is the most narrow part of the castle and the wooden bridge has a length of 27 metres and covers a moat 8 metres deep. In the fourth courtyard were another stable with grain storage on the second floor, the prison, Torture Tower or Witches Tower and a deep dungeon. The Burt zu Burghausen is one of the few castles that had a separate torture chamber. The actual torture devices are now on display at the National Museum in Munich. The fifth courtyard contained the main Tower (Gardener's Tower), which also served as a look out, as well as the tax office, where the tax payments of corn, wine and oil were stored. A small Gothic style chapel, which was built between the years of 1480 and 1490, is also located there. The sixth courtyard is the largest and most changed courtyard of the castle. In the middle stands a Clock Tower (built in the 15th century) with a well house attached to it. In this yard master officials, clergy, craftsmen and their families lived and had their workshops. There was also a horse pond and a horse drawn mill. The towers on the right side of the yard were built during the 14th century and are square, whereas the towers on the left side were built during the 15th century and are circular. The castle grounds are open all day, every day and there is no entrance fee, so you can easily have a look at the world's longest castle complex and enjoy the stunning views it offers. There are both a town museum and a castle museum located inside the Burg though I visited neither. To get a better overview over the castle, hop over to Austria on the other side of the Salzach valley to see it in all its length. For more information, have a look here.